The arrival of Susan the Biplane and Wabsworth offered a different possibility. Susan would tow a baited anchor to lure and hook the Scunner Fish. "What will we use for bait?" asked Lapinette. Wabsworth disappeared briefly and returned bearing an enormous shrimp. Lapinette wrinkled her nose. "Where?" Wabsworth shrugged and commenced a lengthy explanation. "Out at the old abandoned munitions factory there's a strange lake." Lapinette shook her head, loaded the shrimp on the anchor, and clambered aboard. Susan's engine was a deafening roar as she took off and whisked the anchor along the river. "That's dangerous!" shouted Nessie - but they were up and running. 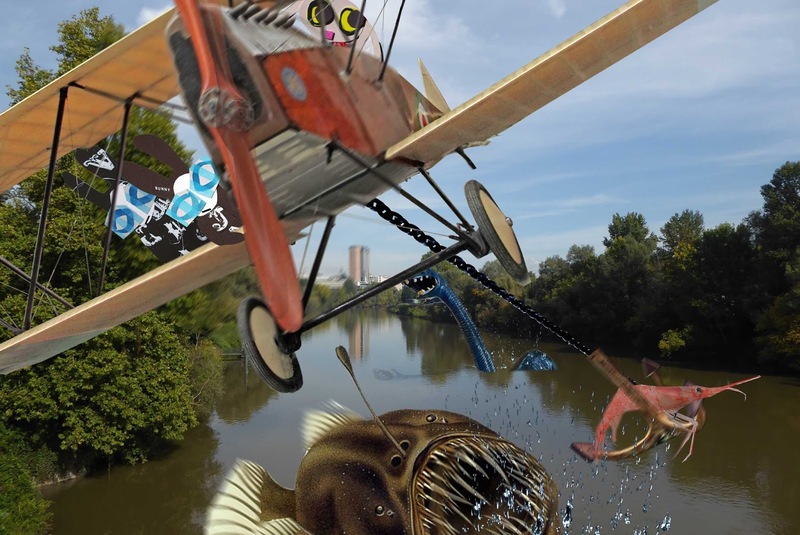 "Extreme fishing," murmured the Wabbit. He held on with one paw and flicked imaginary lint with the other. "There he is!" yelled Wabsworth. With a fountain of spray, the Scunner Akwat soared from the river towards his prey. Susan hung back then flicked the anchor forward. Akwat dived. He missed. "Stupid Scunner! "groaned Susan. She flicked the anchor in the manner of a cat toy. This time Akwat fastened his teeth round the shrimp and swallowed it along with the anchor. He threshed angrily, but he was hooked. "What do we do now?" said the Wabbit. 5.The Wabbit - "Return of the Monstroids"